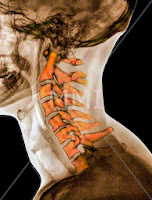 How do spine specialists make the diagnosis of a Cervical Disc Herniation? Spine specialists use information from the patient history, the physical examination and special spine tests to make the diagnosis. an accident followed by neck or arm pain is very common. Some patients have a history of prior disc herniations and can pinpoint that the current problem is “just like when I herniated it before”. Often questions are asked about sensation and strength in the arms. When the disc herniation is causing compression of a spinal nerve we may lose the ability to feel or move the arm. 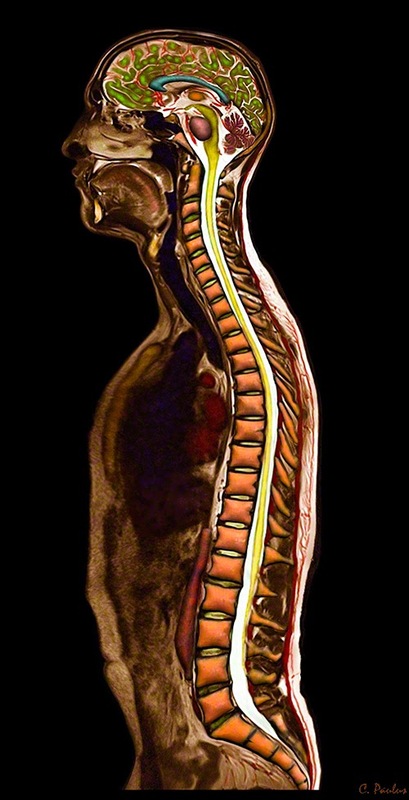 This can be a significant warning sign that the spinal nerve is severely compressed. The spine specialists may also ask specific questions about your bowel and bladder function. 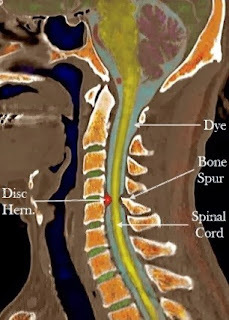 The reason for that is the fact that very large disc herniations can affect the spinal cord. When these structures are compressed, we often have difficulties emptying our bladder and cannot control our bowels. This is rarely the case. However when it is, surgery may have to be performed urgently. 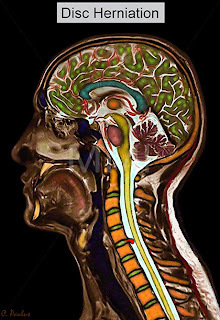 MRI technology is the most advanced tool to actually see a disc herniation. The images created by the MRI will show the discs, the spinal nerves and the spinal cord in detail. It can also show any compression of the spinal cord and spinal nerves by the disc herniation. This study is sometimes used if other imaging studies cannot show a disc herniation, yet the spine specialist is suspecting one. For instance when a patient has had metal inserted in the spine at the time of a previous surgery, the MRI images may be less than optimal in that area. A myelogram may help in this situation to show the spinal cord and spinal nerves. An Electromyogram and Nerve Conduction Study can help evaluate the function of nerves in our arms or legs for patients which might be irritated or compressed from a disc herniation. These studies can often verify which nerve is affected by the herniation, and how healthy the nerve is. It can also tell if the nerve is recovering from the compression. Sometimes this will help with the decision for surgery. A discogram is a study where a spine specialist injects medication into a disc to help make a diagnosis. A disc may look suspicious for a herniation or degeneration on an MRI study, however that may not be enough to prove that it is the source of the pain. A discogram can get more information from the disc, such as whether a particular disc is painful as well as the overall health of the disc.